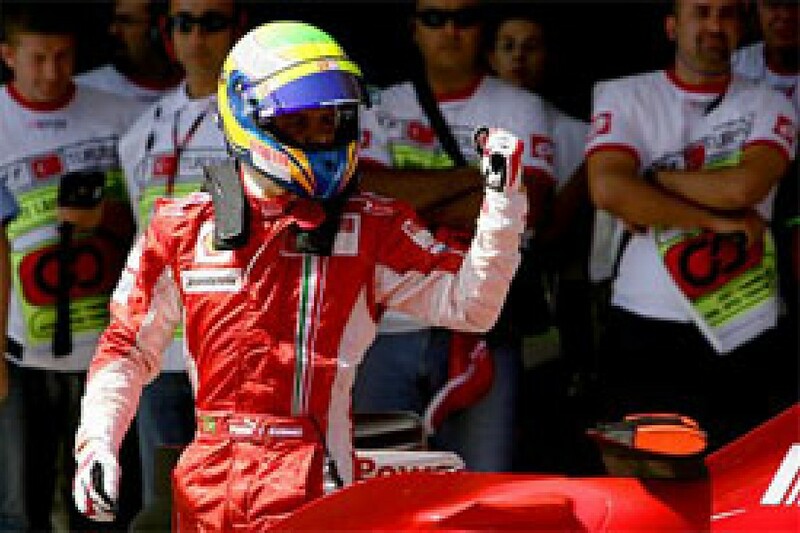 After Hungary, Ferrari declared that they must win all the remaining races this season if they were to stand a chance of beating McLaren to the 2007 championship. In Turkey, they made the perfect start to that mission - not only scoring a one-two, but benefiting from championship leader Lewis Hamilton's puncture to gain more ground than expected on the British rookie. So with five rounds (and a couple of court visits) to go, Felipe Massa and Kimi Raikkonen are now 15 and 16 points respectively behind Hamilton, with Ferrari 11 adrift of McLaren in the constructors' table. Even the backmarker teams go into every Grand Prix aiming for a one-two finish, but only a few will ever be in a position to achieve it at any time. The difference for Ferrari in the closing stages of this season's championship is that they are not simply hoping for one-twos, they know that such results are the minimum they must achieve to overcome their rivals. This would be an easier target if the margins between the top two teams were not still so tantalisingly small. Hamilton's race pace on heavier fuel (matched by Fernando Alonso once he cleared the BMWs) suggested there was nothing to choose between Ferrari and McLaren on Sunday afternoon. Perhaps more than ever, the races - and therefore the championship - are being decided by tiny fractions of time in the closing seconds of qualifying. Massa only beat Hamilton to pole by 0.044 seconds, and that left Hamilton on the dirty side of the track and vulnerable to Raikkonen - who would probably have beaten both to pole had he made a smoother run through the final corners on his best lap. But he didn't, so he started third and despite appearing to be the faster of the Ferraris, he was doomed to follow Massa throughout the 58 laps. Minute fluctuations of form and fortune are proving decisive. "Still all four drivers - two McLaren and two Ferrari drivers - have possibilities to win the title," said Alonso. "You see ups and downs for everybody. It depends on how the weekend goes, how lucky you are in that particular weekend. The better one and the lucky one will win in the end." But while all at Ferrari cling to the dream of endless one-twos and more McLaren misfortune, and Alonso ponders the vagaries of fate, championship leader Hamilton is looking to the final five races with rather more confidence. While all signs may point to this title fight going down to the wire, Hamilton has other ideas. "I'd like to get it earlier," he said. "At the end of the day, though, it doesn't matter whether I clinch it before the end of the season or in Brazil. The important thing is that I get it. "It's a pity to lose a few points (in Turkey), but I'll figure a way to get them back elsewhere..."
Ferrari commanded the opening session of the weekend, with Kimi Raikkonen eight tenths of a second clear of the field for much of the morning. 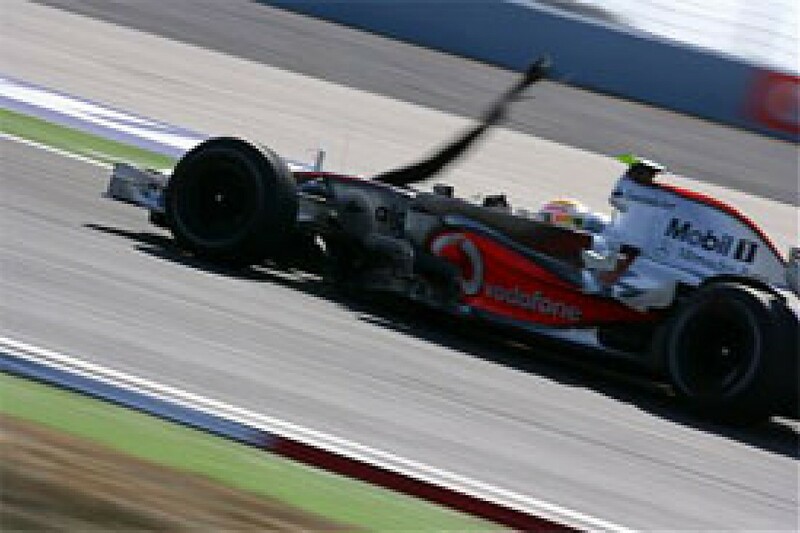 Teammate Felipe Massa eventually closed to within 0.4 seconds, but the McLarens were a full 1.2 seconds adrift in third and fourth. Lewis Hamilton only completed ten laps before a slipping clutch intervened. Nico Rosberg and Heikki Kovalainen completed the top six, with the Toyotas also showing promising pace between spins - as Jarno Trulli rotated once and Ralf Schumacher twice. The session came to a dramatic end when David Coulthard's Red Bull developed a fuel leak and spun on its own fluid at Turn 1. A fire started as Coulthard attempted to rejoin, and he soon abandoned the car. It was a frustrating afternoon for the entire field as a detached drain cover on the exit of Turn 10 led to a half hour stoppage. The cover came loose as Giancarlo Fisichella's Renault passed over it, and was then struck by Rubens Barrichello, causing slight damage to the Honda. Most of the quick times were set in the 20 minutes before the drain incident, and this time it was McLaren and Hamilton on top after a change in wind direction unsettled the Ferraris. Raikkonen still took second, followed by Trulli and Schumacher's Toyotas. Coulthard missed the first half of the session as Red Bull worked to change his engine and repair the damage caused by the morning fire - the Scot having been keen to retain his race car for the afternoon rather than switching to the spare. He ultimately emerged to take 11th. Both Toro Rossos developed transmission issues during the afternoon, with Sebastian Vettel giving Anthony Davidson a scare when the Super Aguri came across the slowing Toro Rosso in the middle of Turn 8 and had to take to the run-off. Davidson then ended the day in the Turn 3 barriers after a solo crash in the final minutes of the session. Hamilton was fastest again in the final session, but luck had been on his side when an electrical glitch brought his McLaren-Mercedes to a halt in the pit exit as he attempted to commence his installation lap. The car stopped just close enough to be retrieved by the marshals and mechanics, and he ultimately joined the session at the same time as teammate Alonso. Despite a spin at Turn 7 on his soft tyre run, Hamilton ended the hour on top with a lap 0.041 seconds quicker than Massa. Raikkonen and Alonso were third and fourth, with Rosberg the best of the rest. Elsewhere in the field, Jenson Button lost time with a hydraulic leak on his Honda, and Takuma Sato missed the final 12 minutes after beaching his Super Aguri in the Turn 3 gravel. With his Formula One future still uncertain, Ralf Schumacher needed to continue his recent strong performances in Turkey. Unfortunately for the German, he instead reprised the poor qualifying form that had cast doubt over his career prospects earlier in the season. Citing locking rear wheels and oversteer, he was only half a second slower than teammate Jarno Trulli in Q1, but that was the difference between a secure 11th place, and an eliminated 18th. Mark Webber almost joined Schumacher on the sidelines, before moving to 15th with his final lap and pushing Toro Rosso's Vitantonio Liuzzi back into the drop-zone. Liuzzi felt that he could easily have found the 0.006 seconds that he needed to progress had traffic on his out-lap not allowed his tyres to cool. He was seven tenths clear of teammate Sebastian Vettel, who lined up 20th. Takuma Sato was a disappointed and baffled 19th for Super Aguri - his puzzlement heightened by the gap to teammate Anthony Davidson as the Briton leapt from 18th to eighth in the session with a superb last lap. Still lumbered with their original car after the 'B-spec' machine failed its crash test, Spyker finished yet another qualifying session at the bottom of the pile. Adrian Sutil was satisfied to be just 2.5 seconds off the pace, but Sakon Yamamoto had another scruffy session - spinning away his first run and then losing the second to a gearbox problem. Like Schumacher, Alex Wurz had struggled in qualifying in the middle of the year before turning his fortunes around in recent weeks. But he too took a step back at Istanbul - going off at Turn 10 on his first Q2 run and then consigning himself to 16th with some smaller errors on his next flying lap. The Red Bulls and Hondas took 12th to 15th places, with Mark Webber and Rubens Barrichello out-qualifying their respective teammates, and both teams simply lacking the pace to progress further. But there would be another blow for Honda after the session as problems were discovered with both Barrichello and Jenson Button's engines. New V8s would be required, and the penalties would send them to the back row. "I thought Hungary was bad..." Barrichello mused. "They told me about the engine this morning. It's a tough moment, but our good time must come." After his star performance in Q1, Davidson briefly looked like he might pull off a real shock by breaking into the top ten for only the second time in Super Aguri's history, as he vaulted from 15th to eighth with his final flying lap. But others were still on track and going quicker, and as Giancarlo Fisichella, Nico Rosberg and Jarno Trulli came through, Davidson was shuffled down to 11th. It was still equal to his career-best start, and a source of huge pride for the British rookie. "It was an incredible lap and one that you dream of doing when you are doing private testing," he said. "It was way over our expectations, but we keep doing this every now and again here at Super Aguri. It is amazing to be that high up on the grid this far into the season when we haven't done anything to the car, and haven't had the budget to do it." With neither Ferrari nor McLaren establishing a clear edge in practice, and just a few tenths covering the top four throughout Q1 and Q2, all of the title-contending quartet clearly had a shot at pole in the decisive session. And after the first flying laps of Q3, just 0.054 seconds covered Felipe Massa, Kimi Raikkonen and Fernando Alonso in the top three positions. But Lewis Hamilton was lagging behind - four tenths down on his rivals and under pressure as he began his second run. "I was thinking 'shoot, it's now or never'" Hamilton said. "On the out-lap I was thinking 'how am I going to do this? Where am I going to find time?' and I was told where I was losing time, and I corrected it. It's not easy to do that, but sometimes it really works." It did on this occasion, as a six tenths improvement took Hamilton straight on to provisional pole. 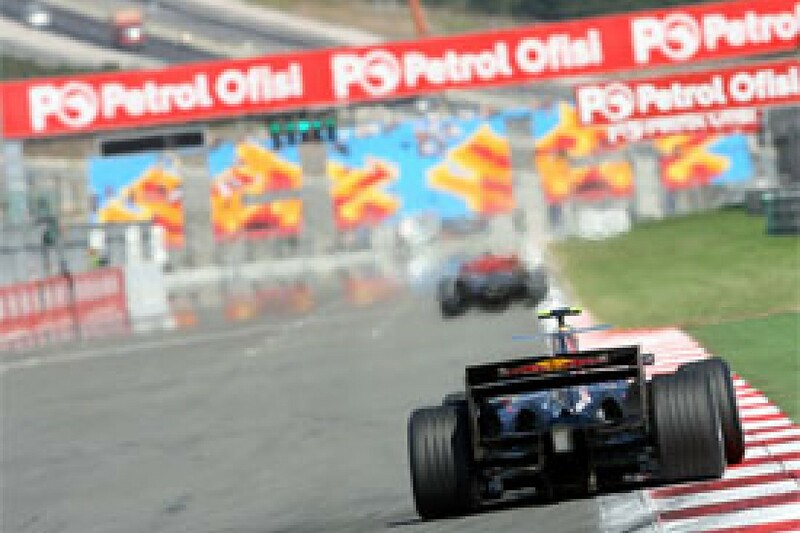 But his tenure was fleeting, for Massa crossed the line a few yards behind and snatched pole back by 0.044 seconds. 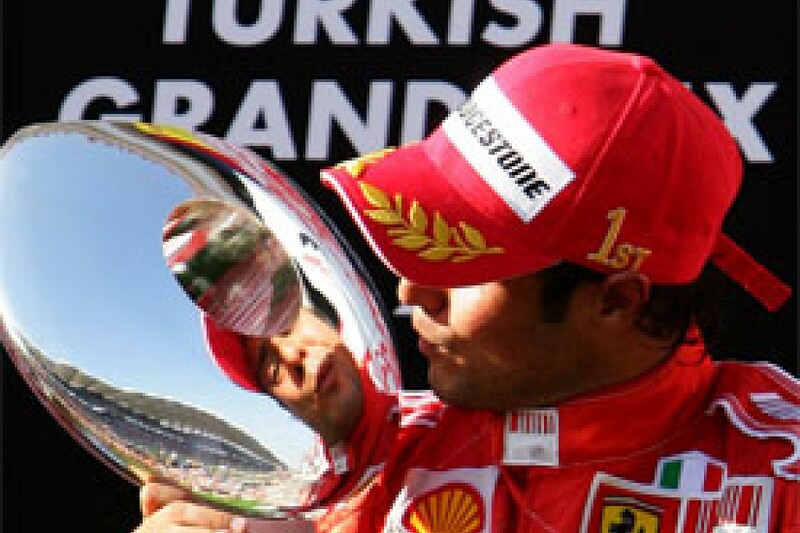 "It was very tight during the whole qualifying with all four drivers but I knew I had a good car and I just knew that if I put everything together I can be very, very quick," said Massa as he celebrated his second consecutive Istanbul pole. "I didn't have a very good lap in Q1 and Q2, I just couldn't put the lap together but I was paying attention to where I was making mistakes to get it right when it counts." That was exactly what Raikkonen failed to do, as an error in the final complex on his best lap left him third. But he remained optimistic. "For sure, I would rather be in first place but I think we have a good race car here. It's going to be a long race so hopefully we can fight back," Raikkonen said. Alonso did not improve either and fell to fourth. He had made a unique decision to switch back to the harder tyres for his last run, but denied this was the reason for his underwhelming result. "Maybe we lost a little bit of performance in the last attempt of Q3, but I don't think it was coming from the tyre," he said. "I think the last lap was not 100 percent and I crossed the line very tight to the finish of qualifying and I had a little bit of traffic in front and I didn't get the maximum from the car. I think the tyres were very, very similar in terms of performance to me." The BMWs took their habitual row three positions, with Robert Kubica recovering from an error on his first run to beat Nick Heidfeld by 0.315 seconds on his second. Rosberg and Heikki Kovalainen had been squabbling behind the frontrunners all weekend, and their battle continued into final qualifying, where Kovalainen beat his former GP2 sparring partner to seventh by just 0.01 seconds. Having been sceptical about Williams' Turkish chances prior to the weekend, Rosberg was now mildly frustrated to only take eighth on the grid. "It was very close between me and Kovalainen right through Q2 and Q3. Seventh would have been possible today, but we needed to get everything absolutely right," he said. Kovalainen was a full eight tenths of a second quicker than Renault teammate Fisichella, who understeered to 10th, behind a similarly unhappy Trulli. "I am having a lot of troubles with the rear end of the car. It is very unstable and I am not confident at all," said the Toyota driver. Ferrari grabbed what would prove to be a decisive advantage within yards of the start, as both Felipe Massa and Kimi Raikkonen coolly accelerated off the grid, while the two McLarens made comparatively tardy getaways. 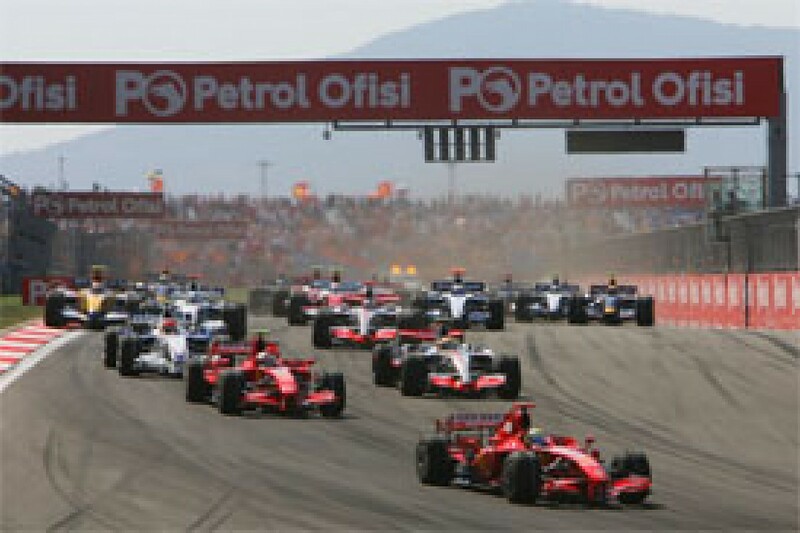 Raikkonen was therefore able to pass Lewis Hamilton for second as they crossed the start line, while Fernando Alonso fared worse still - immediately losing a place to Robert Kubica, and then having to give way to Nick Heidfeld at Turn 1 as the second BMW used its greater momentum to sweep around the outside. Heikki Kovalainen might have made it around the world champion too after making the best start of all the frontrunners, but the Renault ran out of room on the outside and had to tuck in for seventh place, just ahead of Nico Rosberg. Carnage was narrowly averted behind, as Giancarlo Fisichella locked up and slewed into the back of Jarno Trulli, tapping the Toyota into a mid-pack spin. Remarkably there was no further contact - despite Trulli almost spearing into the side of David Coulthard's Red Bull, and both Super Aguris, Jenson Button and Adrian Sutil all having to take to the run-off to miss the Toyota, which quickly rejoined at the tail of the field. 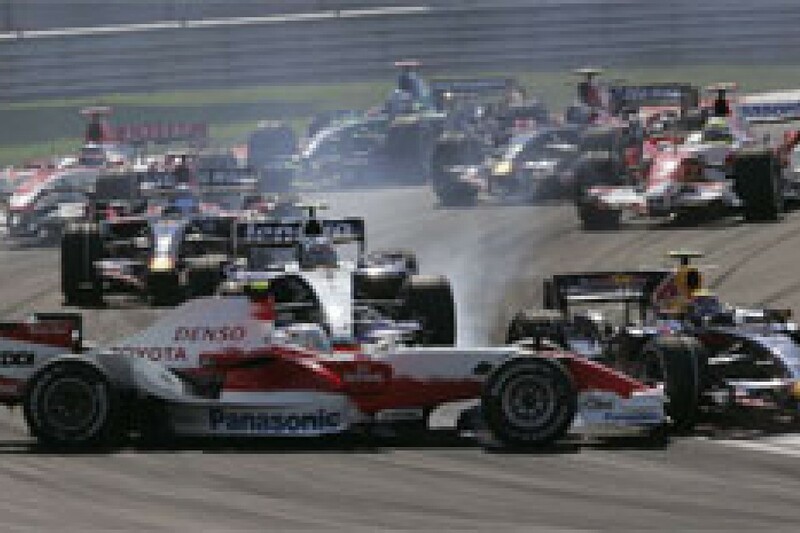 The main beneficiary of the incident was Toro Rosso's Vitantonio Liuzzi, who clung to the inside as those around him were forced wide by Trulli and emerged in 12th place - behind Mark Webber and Alex Wurz, and just ahead of the delayed Fisichella, Ralf Schumacher, Anthony Davidson and Rubens Barrichello. 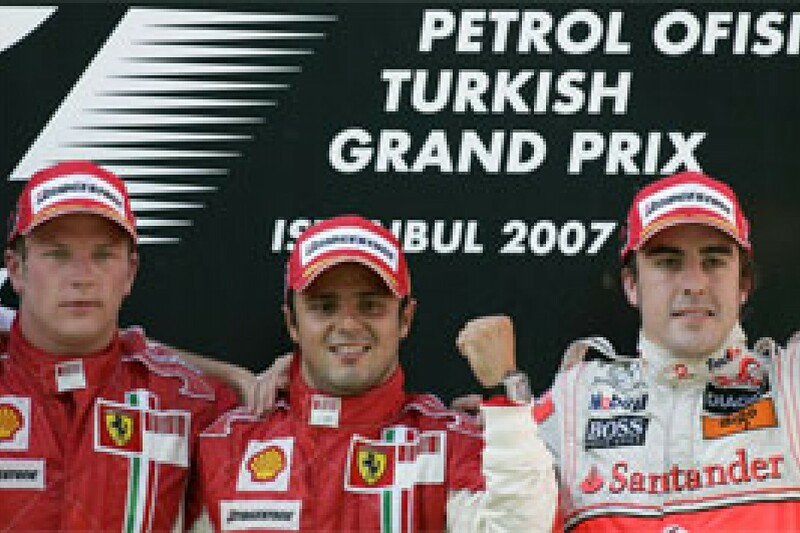 In the early laps there was very little to choose between the top three, with Raikkonen remaining within a second of Massa throughout the first stint and often inching closer. Hamilton couldn't quite keep pace with the Ferraris, but neither did he let them escape and after 10 laps he was still only three seconds adrift. His teammate was having a more frustrating time in sixth behind the BMWs, which were losing a second per lap to the top three. But Alonso was handed an early bonus when fourth-placed Kubica made his first stop as early as lap 12. BMW had hoped an aggressive strategy would get them amongst the leaders - instead Kubica dropped eight seconds behind in his opening stint then exited the pits in the thick of the midfield traffic in 11th. "We wanted to give him the chance with a short first stint and soft tyres to attack the frontrunners, but soon after qualifying we figured out, even with a lower fuel load, the expected times would not be possible," said team boss Mario Theissen. That was one BMW out of Alonso's way, and he only needed one extra low fuel lap to jump Heidfeld when they made their first stops on laps 17 and 18. The Ferraris came in at the same time, with Raikkonen stopping a lap before Massa, who rejoined behind the yet-to-stop Kovalainen, who was producing some rapid low fuel laps for Renault. Hamilton ran one lap further than Massa and along with the Ferraris getting caught behind Kovalainen, this allowed him to close the gap from 4.2 to 2.2 seconds once the stops were completed. The time spent staring at the back of BMWs left Alonso 14 seconds behind Hamilton as the middle stint began, while Kovalainen's strategy allowed him to briefly lead before rejoining between the two BMWs in sixth. Massa again crept away from Raikkonen early in the second stint, before the Finn closed right in on his teammate as the last stops approached. He nearly had an opportunity to try an on-track pass when Massa locked up into the final turns on lap 37, but Raikkonen could not get close enough. He then pitted one lap sooner than Massa again, allowing the Brazilian the luxury of an extra low-fuel lap, and all but guaranteeing that the order would remain the same. Sure enough, Massa emerged from the stops 1.6 seconds ahead and Raikkonen could only wonder what might have been had he not erred on his final qualifying lap. "I pushed hard and got as close as I could and tried to do something at the pit stops, but when two teammates are fighting it is usually that whoever is first is going to stay there," he said. "The race was really decided yesterday." Hamilton had not quite given up hope of interrupting Ferrari's apparently certain one-two. He may have fallen eight seconds behind Massa in the middle stint, but with an additional five laps of fuel over the Ferraris, he had high hopes of closing that gap before his stop. But just after the Ferraris pitted and put Hamilton into the lead, the McLaren suffered a right-front tyre failure approaching Turn 10. "Suddenly I saw some bits flying off the tyre, and then it blew," said Hamilton. "I was quite fortunate I didn't put it in the gravel. I couldn't stop the car - that wheel was locked and I think the rear tyre was coming off the ground, so it was extremely tricky." "It was a failure at the wrong time. We stood a real chance of catching the Ferraris in the last stops," said Ron Dennis. "The right hand shoulders of all the right front tyres down the pit lane were getting quite high temperatures, and unfortunately we had the failure." The incident cost Hamilton just over 30 seconds, but only two places, as he rejoined between Heidfeld and Kovalainen in fifth. His misfortune elevated teammate Alonso to third. The Spaniard had matched Hamilton's pace once free of the BMWs, without ever closing the gap. "I pushed, as hard as I could, but the gap always remained the same," Alonso said. "From lap 30 I was just cruising a little bit." Rather than chasing down and attacking Heidfeld for fourth, Hamilton found himself having to keep a wary eye on the closing Kovalainen - the tyre debris having damaged his front wing. "It made a huge difference," Hamilton said. "I had huge understeer and couldn't get around the corners, so there was no way I could challenge the BMW." Kovalainen was just one second behind Hamilton at the flag, but team boss Flavio Briatore was more pleased to have been competitive with main rivals BMW again - despite Renault having shifted their focus on to the 2008 car. "This is the first race in a long time where we have been competitive with BMW, and it felt like we were back racing properly again," Briatore said. Kubica's early pitting strategy cost him again at the final stops, as he came in on lap 37 and fell behind Rosberg's Williams, where he would remain to the flag - to the German's surprise. "Before this weekend started, I didn't expect that we would finish the race in seventh, so I am very pleased - it was a great race," Rosberg said. "I am also very happy to have beaten Kubica, I didn't expect him to pit before us and we beat him fair and square." Kubica believed his poor race was due to more than just an unwise strategy. "I just hadn't got enough speed," he said. "Every time I pitted someone was overtaking me. I suppose my problems were a bit of everything and I just found the car difficult to drive." His first corner error probably cost Fisichella a chance to push Kubica outside the points, for the Renault showed strong pace thereafter. Fisichella quickly passed Liuzzi, benefited when Mark Webber retired from 10th on lap nine with another hydraulic problem, then moved past both Wurz and Coulthard into ninth by running until lap 22 before his first stop. He then closed to within 2.7 seconds of the battling Rosberg and Kubica by the flag. While Coulthard and Wurz had uneventful runs to 10th and 11th, the midfield pack behind them produced most of the action in the race as the Hondas and Toyotas tried to regain lost ground. Toyota put Schumacher on a one-stop strategy to try and make up for his lacklustre qualifying run, and although the German was unhappy with the heavy car's handling, he still managed to come through to 12th, 14 seconds clear of the charging Button, who got little reward for an aggressive race. 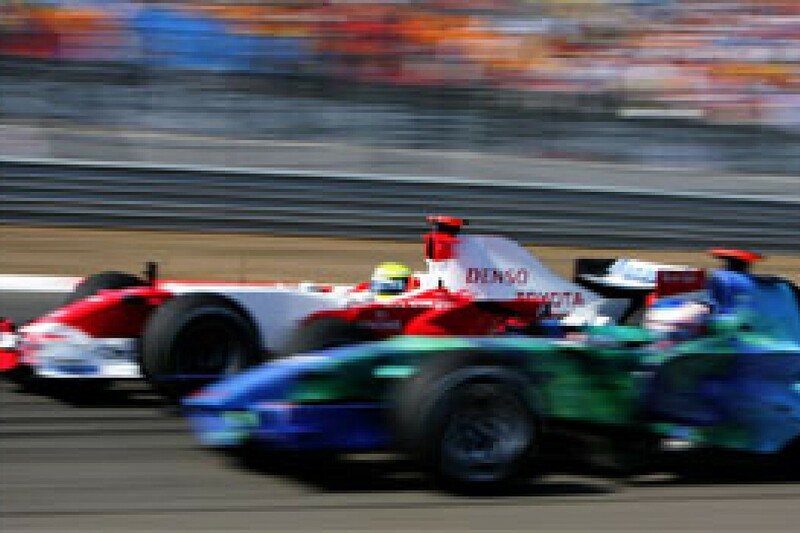 Having fallen right to the tail of the field avoiding Trulli, he fought his way through the backmarkers with a series of determined passes, setting the tenth fastest race lap in the process. After his outstanding qualifying performance, Davidson had to settle for 14th. He only got ahead of Liuzzi at the second stops - the Toro Rosso driver having run as high as ninth and comfortably held his own at the head of the midfield queue for most of the afternoon. The pressure continued right the way to the flag, as Liuzzi finished the race with Trulli and Barrichello right on his tail. Relatively early pit stops hampered Trulli's attempts to hack through the traffic after his early tangle, while Barrichello struggled with the Honda and could not emulate teammate Button's progress. A one-stop strategy helped Takuma Sato to beat Sebastian Vettel to 18th, but they too were overshadowed by their respective teammates. A pit stop stall also cost Vettel time. The Spykers showed better than expected pace, running with Sato and Vettel early on and proving harder than anticipated for the likes of Button and Trulli to overtake. But fuel pressure problems stymied their race, causing both Adrian Sutil and Sakon Yamamoto to stall in the pits. Sutil then jammed in gear and had to be wheeled into the garage so Yamamoto could take service. Nearly four minutes were lost before he rejoined, and the problem then reoccurred on the final lap, leaving Sutil to walk home. Yamamoto got some much-needed mileage on the way to 20th. 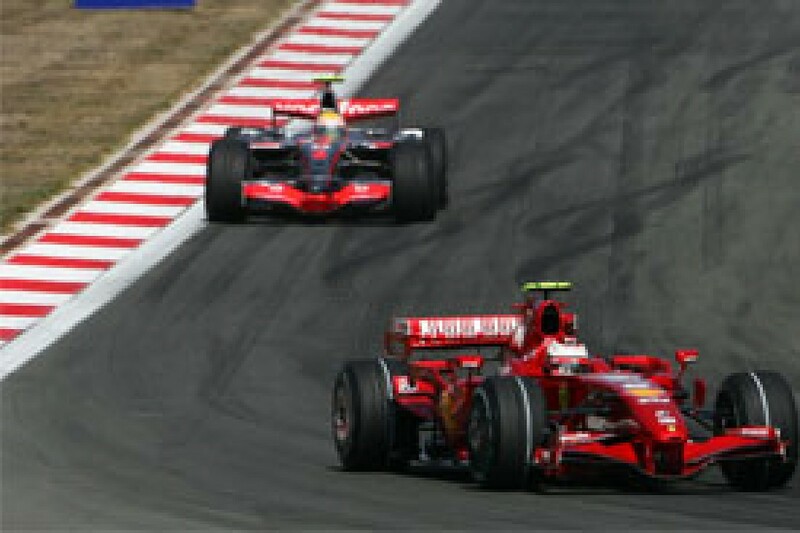 At the front, it was always unlikely that Raikkonen would launch an all-out attack on Massa in the final stint, and indeed he backed right off and allowed his teammate to pull four seconds ahead, before setting fastest lap by 0.7 seconds with four laps to go. It looked like a statement - an unsubtle suggestion that he had been the faster man on the day and had been defeated only by circumstance, but Raikkonen insisted his burst of speed was purely "something to do" to relieve the tedium of the final stint. "It's so boring behind other cars," he said. Massa was far from bored. Three months after his last win, and twelve months since his first ever victory at the same venue, he was overjoyed to be back on top of the podium. "It's amazing," he said. "I love the track, I love the place and here is where my career made a switch and I started to win races and fight with the frontrunners. It is a very special place for me and to have a second consecutive win here, it's difficult to find the right words..."
Hamilton has a few hiccups in practice - a slipping clutch in the first session, and then an electrical issue in the third. 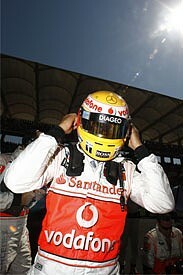 But he's still fastest on Friday afternoon and Saturday morning, then comes close to beating Massa to pole. He loses out to Raikkonen at the start but is closing on the Ferraris again when a tyre failure drops him to fifth. Alonso has a low-key weekend, qualifying fourth and falling behind both BMWs off the line. He passes both in the pits then benefits from Hamilton's problems to take third. Kovalainen has arguably his strongest weekend yet, running strongly throughout practice, qualifying seventh, and then finishing right on Hamilton's tail in sixth, having beaten Kubica in the pits. Fisichella struggles to match the Finn and starts 10th, then loses more ground after punting Trulli into a Turn 1 spin. Shows better pace as he recovers to ninth by the flag. Raikkonen and Massa set the tone with a dominant one-two in first practice, but it's the Brazilian who takes pole and victory after a small error in qualifying leaves Raikkonen only third on the grid. He passes Hamilton at the start then chases Massa relentlessly throughout the race, but pitting a lap ahead of his teammate each time means he cannot jump the Brazilian. 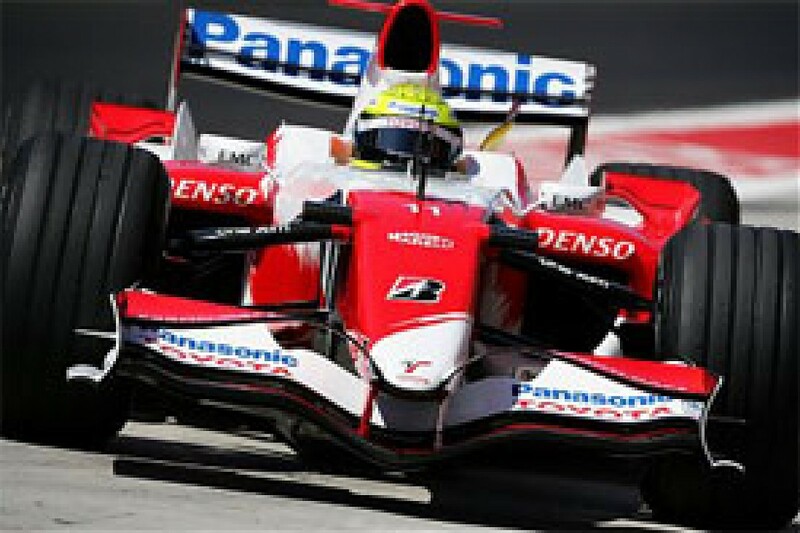 The result brings Massa and Raikkonen to within 16 and 17 points respectively of leader Hamilton. After the nightmare of Hungary, Barrichello and Button are relieved to qualify 14th and 15th - then frustrated when engine problems are discovered and both have to take penalties. 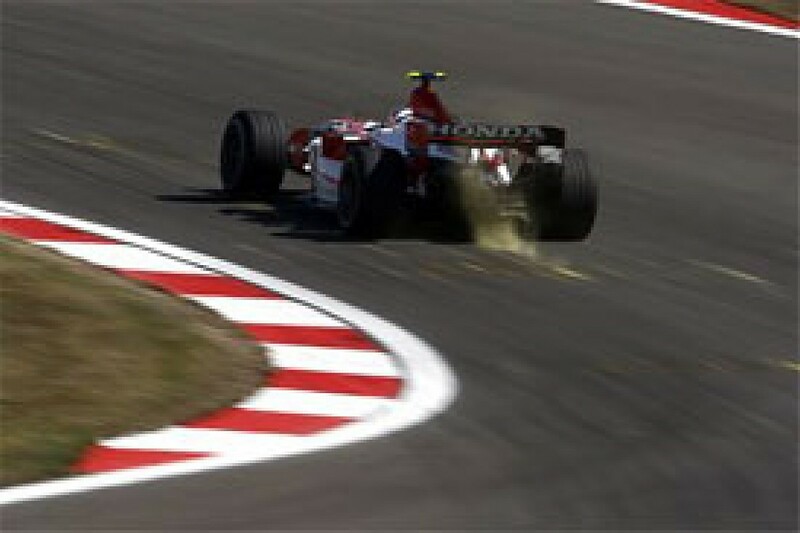 Barrichello avoids the first corner mess and immediately jumps to 16th, while Button goes off-track and falls to last. But it's the Briton who has the better race pace and he charges to 13th, while Barrichello can only manage 17th. Kubica and Heidfeld share row three once again, but having put the Pole on an aggressive strategy the team had hoped for better. His light fuel load proves a handicap in the race, as early stops drop Kubica back into the traffic. He also struggles with the handling and can only finish eighth. Heidfeld takes yet another fourth place, passing Kubica in the first stops but losing out to Alonso at the same time, then benefiting from Hamilton's puncture. Schumacher and Trulli both spin in first practice, then go third and fourth fastest in the second session. But while Trulli shrugs off general discomfort with his car to qualify ninth, Schumacher can only manage 18th on the grid. They're soon both at the back, as Fisichella taps Trulli into a spin at the start. His short-stinting strategy is not ideal for coming through the traffic, and he can only recover to 16th, while a one-stop plan allows Schumacher to progress to 12th. Coulthard's weekend starts with a bang as a fuel leak causes a spin and fire on Friday morning. Repairs then mean a late start to the afternoon session. He qualifies 13th, just behind teammate Webber, who was unhappy with his car on Friday. They run ninth and tenth at first, Coulthard ahead, until Webber retires with hydraulic failure on lap nine. Coulthard is passed by Fisichella in the stops and takes 10th. Rosberg flies throughout practice, qualifies eighth and finishes seventh, beating Kubica during the second pit stops and then holding the BMW at bay in the closing laps. Wurz has another poor qualifying run and starts 16th, but improves to 11th in the race. Both Liuzzi and Vettel are struck by transmission problems on Friday, then qualify 17th and 20th respectively. Liuzzi jumps to 12th at the start and races well in company with the works cars, coping with pressure from faster machinery all afternoon. Eventually finishes ahead of Trulli and Barrichello in 15th. Vettel is not on Liuzzi's pace, stalls at a pit stop and finishes 19th. Sutil and Yamamoto are slowest in qualifying, with the Japanese returnee spinning in Q1. But they are stronger in the race, lapping on a par with Sato and Vettel. Fuel pressure problems cause both to stall in their first stops, with Sutil also getting stuck in gear and having to be taken into the garage for repairs. He loses three laps before continuing, then retires with the same problem on the last lap. Yamamoto is only delayed by a few seconds, and then has a quiet race to 20th. Both Davidson and Sato go off the road in practice, Davidson making it all the way to the barriers at Turn 3 on Friday afternoon. He atones in qualifying, with a superb run to 11th. He loses ground avoiding the spinning Trulli at the start and ultimately finishes 14th. Sato struggles for qualifying speed and starts 19th, then has a similarly difficult race to 18th on a one-stop strategy. Lap 1: On pole position for the fifth time this season, Felipe Massa gets away smartly to lead into Turn 1. Fellow front-row starter Lewis Hamilton is usurped by Kimi Raikkonen, while BMW Sauber team-mates Robert Kubica and Nick Heidfeld vault Fernando Alonso to take fourth and fifth. Heikki Kovalainen settles into seventh ahead of Nico Rosberg, David Coulthard, Mark Webber, Alex Wurz, Tonio Liuzzi, Giancarlo Fisichella, Anthony Davidson, Ralf Schumacher, Rubens Barrichello (up from last after both Hondas take 10-position grid penalties for unscheduled engine changes), Sebastian Vettel, Adrian Sutil, Sakon Yamamoto, Jenson Button, Jarno Trulli who spun at Turn One following a nudge from Fisichella) and Takuma Sato. Lap 2: Massa leads by 0.8 seconds. Button passes both Spykers. Trulli passes Yamamoto. Lap 3: Fisichella passes Liuzzi, Button and Trulli pass Vettel. Sato passes Yamamoto. Lap 4: Massa leads Raikkonen by 1.2 seconds with Hamilton a further 1.5 seconds adrift in third. Lap 6: Raikkonen posts a 1:28.698 and trails by 1.0 seconds. Trulli passes Button. Lap 8: Sato runs wide at Turn 10 but doesn't lose a place. Lap 9: Webber runs wide at Turn Five and retires to the pits at the end of the lap. Lap 11: Raikkonen laps in 1:28.457 and closes to within 0.8 seconds of Massa. Button repasses Trulli. Lap 12: Kubica makes the race's first scheduled stop. Lap 13: Massa posts a 1:28.388. He leads by 1.1 seconds. Lap 14: Massa goes faster again: 1:28.302. Lap 15: Raikkonen responds: 1:27.941. Lap 16: Button passes Barrichello. Lap 17: Heidfeld, Rosberg and Coulthard pit. Lap 18: Massa laps in 1:27.922. Raikkonen, Alonso and Wurz pit. Lap 19: Massa pits and rejoins comfortably clear of Raikkonen. Lap 20: Hamilton pits, as does Trulli. Lap 21: Temporary leader Kovalainen pits, as does Sutil (who stays there for more than a lap). Button passes Coulthard. Lap 22: Fisichella, Button and Yamamoto pit. Lap 23: Massa leads Raikkonen, Hamilton, Alonso, Heidfeld, Kovalainen, Kubica, Rosberg, Liuzzi and Fisichella. Barrichello pits. Lap 29: Button passes Davidson. Lap 30: Button passes Liuzzi. Lap 32: Schumacher and Sato pit. Lap 37: Kubica and Liuzzi pit. Lap 38: After closing on Massa through lapped traffic, Raikkonen is right with the leader. Lap 41: Raikkonen and Heidfeld pit. Lap 42: Massa pits and rejoins ahead of Raikkonen. Kovalainen, Coulthard and Davidson come in, too. Lap 43: Hamilton sustains a punctured front right. He limps to the pits. Alonso and Fisichella make more conventional stops. Lap 44: Massa leads from Raikkonen, Alonso, Heidfeld and Hamilton. Wurz and Trulli pit. Lap 50: Trulli passes Barrichello. The only battle of note is between Rosberg and Kubica, for eighth. Lap 57: Raikkonen stirs to set fastest lap: 1:27.295. He is 5.4 seconds behind Massa, however. Lap 58: Massa scores his third victory of the campaign, 2.2 seconds clear of Raikkonen. Alonso takes third from Heidfeld, Hamilton, Kovalainen, Rosberg and Kubica.